It is always good to switch Yoga teacher every now and then so that you get to hear and learn different things. My usual Sunday class was replaced by Xiang, a male teacher with huge belly. lol. We don’t always get the chance to see ugly teacher, don’t we? Alright, albeit his huge belly, he is as flexible like any one of us. Forward bend, headstand, split…. no problem at all but he did claim that the huge belly does blocking his way in forward bending. Back to the class, it’s the usual Sunday afternoon where people would prefer to stay home for nap rather than working out. The classes consist of three yogis only. End of the class, Xiang explained a few theory to us like the benefit of yoga. It helps to increase flexibility and increasing lubrication of the joints, ligaments and tendons.Â It is important to always practice counter pose for every asana.Â Failing which, the muscle will get harden.Â Once it is harden, there is no way to make it flexible again.Â Just look at the guy in the gym – 6 packs and huge muscle.Â But then, these people is not able to remove their shirt or even reaching out to scratch their back.Â Good thing I always love Yoga. A cup of drink albeit any type of drinks will not be as healthy as the one you make at home, or at least they are free from excessive sugar and fat free ingredients.Â Just as much as I love smoothies, I made them at home quite often too using the finest ingredients. Frozen some strawberry flavoured milk in an ice tray. Frozen a cup of low fat yoghurt too. Once set, place them in a blender with 6 pieces of fresh strawberries. No sugar add, please! Blend ingredients till smooth. Garnish with strawberry and serve immediately.Â You can be a bit creative by adding banana + strawberries.Â They taste great too. Hot Yoga is also known as Bikram Yoga in Sanskrit. Ideally, the room was heated to 105Â°F (40.5Â°C) with a humidity of 40%. However, classes are guided differently everywhere. At the place where I attended classes, the heater was left running for 45 minutes throughout the duration of classes. Sometime 15 minutes before Savasana, the heater was then switched off again. As you can imagine, a vigorous yoga session at this temperature promotes profuse sweating which believe will help you to lose weight, get rids the body of toxins and also makes the body very warm and therefore more flexible. It is essential to bring along a towel slightly larger than normal and your clothes should be of cotton or any absorbent fabric. For my personal opinion, Hot Yoga has some con too. It makes my facial skin very dry no matter how much water I drank after class. I can’t tolerate with the intense heat. First 20minutes in the asana, I started to feel a bit nausea. After 30 minutes, I started to feel short of breath, giddy and wanna throw up. And most of the time, I regretted coming to the class and get torture. Urgh… why do I pay to get tortured? Kinda stupid right? While huffing and puffing and perspiring all over, many question is racing inside my head like… I wish the instructor will switch off the heater now…. I looks fat in the mirror. No, it’s the clothes!… I can’t hold any longer in this asana. Gosh, I’m slipping…. That person in the front row is showing of… I can’t wait till this is over… Yea, right. Come back again tomorrow. Are you insane?… oh, I get to lie down again. This isn’t so bad… she is turning off the heater… phew… it’s over… finally!… towel… towel… I think i almost fainted…. nice music… nice savasana… Namaste! If you tilt your head to your left and put a little imagination, this asana looks like an archer’s bow. That is how the name comes by. While in the Bow position, pull your leg more towards the back to get a better arch on the back. The more you pushed your leg, you will find yourself being lifted away from the mat. You may rock yourself back and forth or get an assistance like the children’s wooden swing sets toy. That always add some chuckle in me. There’s always some good benefits in every asana.Â When you rock yourself back and forth, you are giving your abdominal muscle some massage at the same time, reducing the abdominal fats, reliving of constipation and gastrointestinal disorders.Â If you want that slim tummy, go rock yourself now. 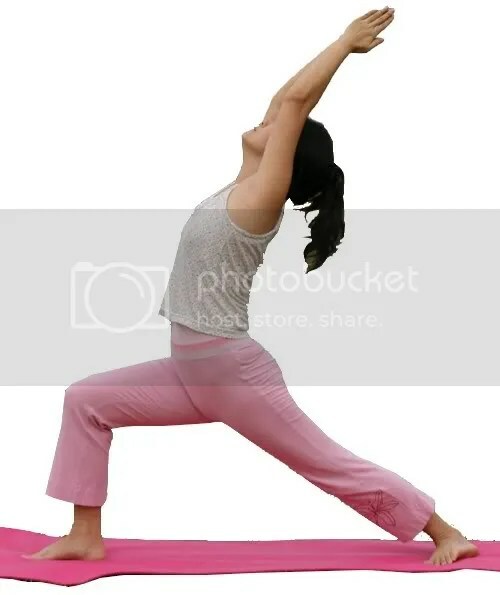 Garland posture or better known Malasana is believe to help relieve menstrual pain.Â However, you should practise the asana before or after your period as Yoga is rarely practice during a menstrual cycle.Â Other than relieving menstrual pain, it is believe to help regulate menstruation flow. As you exhale, bent forward between your legs, bring your arms back and around your leg and hold your heels from behind.Â You bend lower down and rest your forehead on the mat.Â Remember not to lift your heel up and keep them together. This is yet another version of crescent moon posture. For beginner, you may rest the back knee on the mat.Â If you want a challenge, you may come up to this posture from Warrior 1.Â This posture helps you to strengthen your back, arm and shoulder at the same time opening up the chest and hips thus improving balancing.Â Look up to the sky instead of dropping your head to the back which may hurt your neck.